"AH BOYS TO MEN" THANK YOU PARADE HAPPENING THIS SUNDAY! AH BOYS TO MEN’S director and cast is going on an Open Top Bus to say a big THANK YOU for all your support! Fulfilling Director Jack’s earlier promise, he will be parading with the “Ah Boys” on an Open Top Bus on coming Sunday 31st March to thank all who supported AH BOYS TO MEN 1 & AH BOYS TO MEN 2, and for making local box office history happen. They will start at 3PM from Singapore Flyer moving towards Orchard and Bugis area. 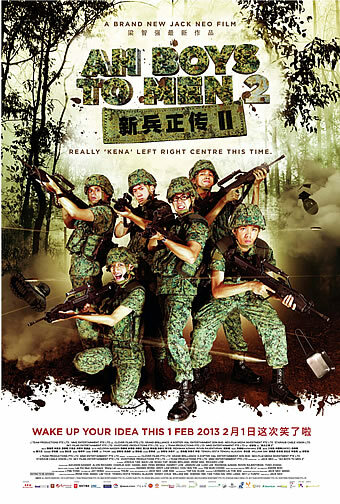 AH BOYS TO MEN 2 continues to triumph the box office, bringing All-Time Local Box Office record to S$7.87 million, as of 25 March 2013. This fantastic box office results also puts AH BOYS TO MEN 2 on the 8th position on all-time box office chart, beating Hollywood blockbusters such as Spider Man 3 and Harry Potter & The Deadly Hollows Part II. "AH BOYS TO MEN 2" IS TOP GROSSING MOVIE IN SINGAPORE OVER THE CHINESE NEW YEAR WEEKEND! Homegrown million-dollar director Jack Neo’s highly anticipated sequel AH BOYS TO MEN 2 《新兵正传 II》 is the best-selling Chinese New Year movie this year after it collected S$2.72 million over the Chinese New Year long weekend from 7th to 12th February! As of yesterday, AH BOYS TO MEN 2 grossed a total of S$4.67 million after 13 days, since the movie released on 1st February, with a total of 44 screens island-wide. The fantastic box office result pushed AH BOYS TO MEN 2 as the No. 4 best-selling local movie of all time in Singapore! Currently, AH BOYS TO MEN 1 (S$6.2 million) and MONEY NO ENOUGH 1 (S$6.02 million) took the first two positions in the chart. The producers are confident that AH BOYS TO MEN 2 will definitely break the box office record held by AH BOYS TO MEN 1 as the movie looks set to gross more than S$7 million at the end of the film’s run, making it the number one Asian movie in Singapore of all time! Be the first to catch "AH BOYS TO MEN 2" and stand a chance to win an iPod Touch! Here's another reason to be among the first to catch "AH BOYS TO MEN 2" when it opens in cinemas this week! Golden Village is proud to announce that in the film's opening week, an iPod Touch will be given away daily from 1 - 7 Feb to 7 lucky winners! 1) Take a snapshot of yourself with your AH BOYS TO MEN 2 movie ticket stub. 3) Entries should be in by 23:59 everyday - the lucky winner of the day will be announced the next day. *AH BOYS TO MEN 2 opens islandwide on 1st Feb and is reviewed here. Producers of AH BOYS TO MEN, together with Golden Village Multiplex, are presenting the “AH BOYS TO MEN MARATHON” exclusively at selected Golden Village cinemas! For audiences who have watched AH BOYS TO MEN and cannot wait to watch the sequel, they definitely cannot miss this chance to catch the local blockbuster back to back! “AH BOYS TO MEN MARATHON” will only be available in selected GV outlets including, GV Plaza, GV City Square, GV Tampines, GV Marina, GV Bishan and GV Jurong Point for a limited period of 4 days from 31 Jan to 3 Feb! Tickets will be on sale via www.gv.com.sg and other Golden Village sales channels from Thursday, 17 January onwards. Tickets are at $21 for GV Movie Club members and $25 for public. Each marathon ticket comes with a Goldbites TM Caremel Popcorn. Homegrown record-breaking director Jack Neo will be bringing his latest Chinese New Year blockbuster AH BOYS TO MEN 2 to Festive Grand™ Theatre at Resorts World® Sentosa for the Gala Premiere on 30th January! AH BOYS TO MEN 2 is the first local movie to hold a Red Carpet event and Gala Premiere at the Festive Grand™ Theatre. Directed by million-dollar local director Jack Neo, AH BOYS TO MEN 1 has grossed a stunning S$6.19 million as of yesterday, 8th January 2013. With the fantastic box office result, the producers have announced that the sequel, AH BOYS TO MEN 2, will open on 1st February 2013! The release date is now a week earlier from the previously scheduled 7th February, for the audience to catch the sequel earlier and before the Chinese New Year holidays. The highly anticipated sequel, AH BOYS TO MEN 2 has also released its official trailer on 22nd December 2012, and garnered a total of 231,431 hits in merely 18 days ! "AH BOYS TO MEN" demolishes a 14-yr record to become the highest local movie of all time! Local blockbuster AH BOYS TO MEN has achieved record-breaking results at the local box office chart again! The movie grossed a remarkable S$6.03 million as of yesterday, 17 December, breaking MONEY NO ENOUGH’s 14-year-old record as the number one Singapore movie at the all-time local box office chart! MONEY NO ENOUGH collected a total S$6.02 million previously. ''AH BOYS TO MEN' soars to 2nd position in the local box office movie charts! Renowned homegrown Director Jack Neo’s latest movie AH BOYS TO MEN continues to fire at the box office chart! It has beaten MONEY NO ENOUGH 2 and claims the No. 2 spot in the all-time local movie box office chart! AH BOYS TO MEN has collected a remarkable S$4.90 million as of yesterday 25 November 2012, after playing in theatres for a mere 18 days (8th Nov - 25th Nov)! This result puts AH BOYS TO MEN at the 2nd position in the local movie box office chart, beating Jack Neo’s very own MONEY NO ENOUGH 2 which grossed S$4.87 million and I NOT STUPID 2 which grossed S$4.2 million. Jack Neo’s classic MONEY NO ENOUGH still tops the chart with S$6.02 million. As of now, AH BOYS TO MEN is the No. 1 Asian movie in Singapore this year! AH BOYS TO MEN has crossed the S$2mil mark at the local box office. Can it become the highest grossing local movie of all time? After scoring the biggest opening day for a local movie outside the lucrative Chinese New Year period, Jack Neo has established yet another record - and an even more significant one at that. His latest movie, AH BOYS TO MEN, not only knocked SKYFALL off its perch at the local box office, but collected S$1.51mil to be the biggest ever opening weekend for a local film! More to come, especially since we are quite sure it will continue breaking records in Singapore! Renowned homegrown Director Jack Neo has taken down the number 1 spot at the local box office chart with his latest movie AH BOYS TO MEN! The movie collected an amazing SGD$234,000 at the cinemas yesterday with a total of 37 prints island-wide! This is the biggest opening-day box office for a local film outside of Chinese New Year festive season! AH BOYS TO MEN was the top movie in Singapore yesterday, beating Hollywood’s blockbuster SKYFALL which is in its 2nd week at the cinemas. The producers are confident that the movie will gross a total of more than SGD$3 million at the end of the film’s run, becoming the number one local movie of 2012! Are you ready for the AH BOYS TO MEN evolution? In commemoration of Singapore’s 45th year of National Service, renowned homegrown director Jack Neo returns with a S$3million production – Ah Boys To Men. The movie stars local veteran actor Richard Low, well-known actress/comedienne Irene Ang, celebrated musician Roy Li and actors Wang Lei and Jacky. On top of these familiar faces, Jack Neo also introduces fresh faces to the cast lineup, including famous bloggers Mr Brown, Qiu QIu and Tosh. In conjunction with the NS45 campaign “From Fathers To Sons”, the movie shares how youngsters now step out of their comfort zone and learn the importance of protecting their country. Ah Boys To Men is sure to bring back memories for Singaporean men who have previously served National Service and at the same time, interest young boys who have yet to join the army. As seen from the movie poster, Ah Boys To Men is a coming of age film portraying the evolution of manhood.